The Hope College Great Performance Series will present ETHEL featuring Robert Mirabal in “Music of the Sun” on Friday, Jan. 27, at 7:30 p.m. in Dimnent Memorial Chapel. Acclaimed as one of America’s leading postclassical string quartet, ETHEL seeks to boldly infuse contemporary concert music with fierce intensity, questioning the boundaries between performer and audience, tradition and technology. Three-time Grammy Award-winning Native American flutist Robert Mirabal is joining ETHEL to create a cross-cultural contemporary music event. The evening will highlight instruments of the string quartet, and Native American flutes and drums. “Music of the Sun” is a program inspired by Native American sun traditions, in which each day begins with “running to the sun”—a fusion of spiritual and physical discipline. The collaboration grew out of the ETHEL/Mirabal work as part of ETHEL’s “TruckStop” project, which premiered at the Brooklyn Academy of Music in 2008. 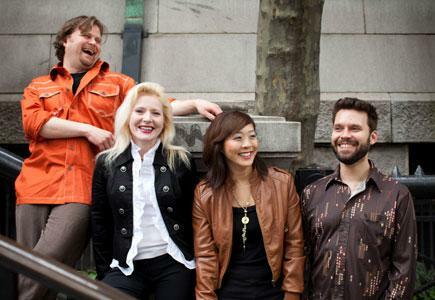 Formed in 1998, New York’s ETHEL is comprised of Juilliard-trained performers: Cornelius Dufallo (violin), Dorothy Lawson (cello), Jennifer Choi (violin) and Ralph Farris (viola). ETHEL performs adventurous music of the past four decades, including repertoire by Steve Reich, Osvaldo Golijov, Phil Kline, David Lang, John King, John Zorn, Don Byron and Marcelo Zarvos. Recent highlights have included the world premiere of Phil Kline’s “SPACE” at the gala reopening of Lincoln Center’s Alice Tully Hall; the world premiere of ETHEL’s “TruckStop: The Beginning” at BAM’s Next Wave Festival; the world premiere of “RADIO” by Osvaldo Golijov at the debut of WNYC Radio’s Jerome L. Greene Space; theworld premiere of ETHEL’s self-composed “WAIT FOR GREEN” with choreography by Annie-B Parson, commissioned by the World Financial Center; the world premiere of an original live film score at “Celebrate Brooklyn!”; and the TROMP Festival with Colin Currie and Todd Rundgren. ETHEL currently serves as Ensemble-in-Residence with the Native American Composers Apprenticeship Project and the 2011 Artists-in-Residence at New York City’s Park Avenue Armory. Tickets are $18 for regular admission, $13 for senior citizens, and $6 for children 18 and under, and are available online at https://tickets.hope.edu/ticketing and at the ticket office in the main lobby of the DeVos Fieldhouse. The ticket office is open weekdays from 10 a.m. to 5 p.m. and can be called at (616) 395-7890. The Hope College Alumni Association will present 1943 graduate Barbara Dee Folensbee Timmer of Holland with a Meritorious Service Award on Saturday, Jan. 28, during the college's annual Winter Happening event. Hope College will feature the Eisenhower Dance Ensemble on Friday and Saturday, Jan. 27-28, at 8 p.m. at the Knickerbocker Theatre in downtown Holland.